On December 31, 2014, I’m quitting my job as a research professor in the psychiatry department at the University of Pennsylvania School of Medicine. From a writer, one typically expects such a sentence to end with a coda like “to focus on my writing, damn the torpedoes and dental insurance.” But I’m not there yet. I have a few self-published books that don’t sell; I’ve never gotten an agent more than provisionally interested in a novel; I haven’t traditionally published a short story since 2008. I also have a wife and two kids, and collectively we need my income to cover the basics. So: On February 2, 2015, I’ll begin work as a software engineer and data scientist at a startup called Big Health. There are a number of perks associated with this move, notably a zero commute (I’ll work remotely except for quarterly company meetings), a rather better compensation package, and January. Not every January. But this January? This one is mine. And I know exactly what I’m going to do with it. I spend a lot of time with three men in my head—mostly because it beats listening to my inner postal worker muttering about water fluoridation while I’m washing dishes. Those men are Johnny B. Truant, Sean Platt, and David Wright of Sterling & Stone and the Self-Publishing Podcast. I haven’t met them or even corresponded with them, but their success in making a living from writing has worn deep channels into my mind over the last year and a half or so. Their fingerprints are all over this site, in fact: The mailing list link, the fact that I’m shelling out for hosting at all, the affiliate links, the ampersanded company name. And January. Johnny, Sean, and Dave write fast. They’re not the only people who do, but they’ve introduced me to all the other people who do. And they’re at the high end, I think—Johnny has talked about regularly hitting 8000-word daily quotas. At 250 words a page, 8000 words amounts to about 32 double-spaced pages, or a very short novelette. A week’s work, or 40,000 words, is a very short novel. A month’s work, 160,000 words, is The Dandelion Knight, which took me five years to write, edit, and publish. My daily quotas, when I’ve hit them, have been about 1000 words. Which still adds up, and has added up; I’ve written two novels and a solid double handful of novellas and short stories at that rate. A 30,000-word January would be one of the better writing months I’ve had, for sure; that would be two novelettes or a really good start on a novel. Note well, though: Those daily quotas have been dialed in almost exclusively on the 50-minute train ride from Trenton to Philadelphia. On a per-hour basis, I write as fast as the SPP guys already. Maybe I can’t hit 8000 words a day from Day 1. But surely this opens up wider vistas than just starting a novel. One of the pillars of the SPP guys’ productivity is beats. This is what everybody else calls outlining. Rachel Aaron swears by beats as well; she claims that knowing what you write before you write it can more or less double your word count per unit time. This is qualitatively consistent with my experience: I spent a couple of days outlining my most recent book, The Eighth King, and routinely hit my word count goals with time to spare. Knowing where your book is going, and by what waypoints, is hugely freeing to creativity at the word-by-word level. I know this, but I’ve always resisted it. There’s a point, usually rather early in planning, by which I’m really itching to write. I’m at that point as I write these words, in fact, in early December 2014. But I’m resisting it. The thousand words I could write in this hour on the train will be a small fraction of my total word count for January—which is to say, even a small multiplier on my productivity for the month will repay the words I lose now. Of course, “now” I’m not planning out my writing. Now I’m writing to you about my writing. If it was ever new for writers to expose their process, it isn’t any longer. The Writing Excuses crew have a great series of podcasts where they workshop a short story each; the podcasts are free and highly educational, and also a clever funnel into a short anthology, Shadows Beneath, in which they’ve published both the rough and final versions of each story. The SPP guys have their Fiction Unboxed project, the literary equivalent of Whose Line Is It Anyway?, where they crowdsourced a genre and story idea, wrote and published the novel in a month, and let their backers into every word and minute of the process. This is work coming from people at the top of their fields, and well worth studying. But most of us aren’t at the top of our fields. Most of us aren’t full-time writers, and won’t be able or inclined to be in the near future. Most of us don’t have collaborators, like the SPP guys, to spark new ideas and spur us on in story meetings; most of us don’t have the polished critical sensibilities of the Writing Excuses crew. So, if this little essai has any value at all, it’s this. I’ve been writing as hard as I know how for ten years now, and it’s gotten me somewhere. I’ve traditionally published two short stories, placed respectably in a couple of contests, completed a couple of novels and gotten the occasional sniff of interest from agents. I think there are a lot of people like me out there. In the weeks that follow, I hope this will give shape to the possibilities of your own writing career: What could you do with a month to yourself, if you planned it out? How far could you come in that time? How might it fuel your writing when the month is over? I don’t have any idea, by the way, what my own answers to these questions might be. That’s part of the point of this. And it’s long past time to talk about what “this” is. I have 20 weekdays in January. I think I can write at an average rate of 5000 words per day, for a total of 100,000 words. I’ll start at 4000 words per day on January 5 and ratchet up by 100 words a day to finish with 6000 words on January 30. The 100,000 words will be divided among two short fantasy Westerns, The Claim and The Candidate. The third book, The Crescendo, will complete a trilogy, but I have a lot of thoughts about what else might go on in that story world, and there will almost certainly be more books after that. 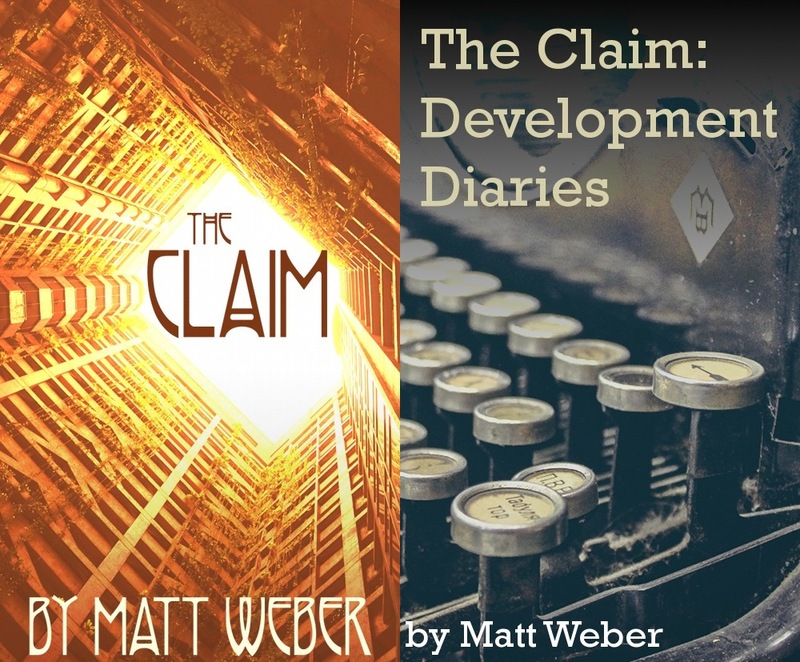 As I write, all three books are planned out with paragraph synopses; The Claim has chapter-by-chapter beats, and I plan to write those for The Candidate during the remainder of December. I’m hoping to reserve the word count push for mornings. Not that I’ll have any lack of things to do in the afternoons—preparation for the new job, work on postdoc projects, housework, and exercise will hopefully all feature, and of course I’ll be posting raw words and production notes here. In the weeks to come, I’ll be posting process notes, beats, synopses, and notes about the story world. During January, I’ll take a page from Fiction Unboxed and post a brief diary entry about each day’s work—what was great, what was hard, how my beats failed me, how I transcended them. After January, I’ll continue posting regular updates on the rest of the publication process—revision, cover design, launch plans, and so on. Of course, like any set of story beats, these plans are provisional. I have an arc plotted out for this little experiment, and it ends in my first real indie publishing success. But no plan survives contact with the enemy, and I am beset by enemies—resistance, obscurity, obligations, poor discipline, cat videos. I can’t promise I’ll show you the secret kung fu to vanquish those enemies; but I think I can promise you a hard and bloody battle. And, really, this is the Internet; what else are you here for?